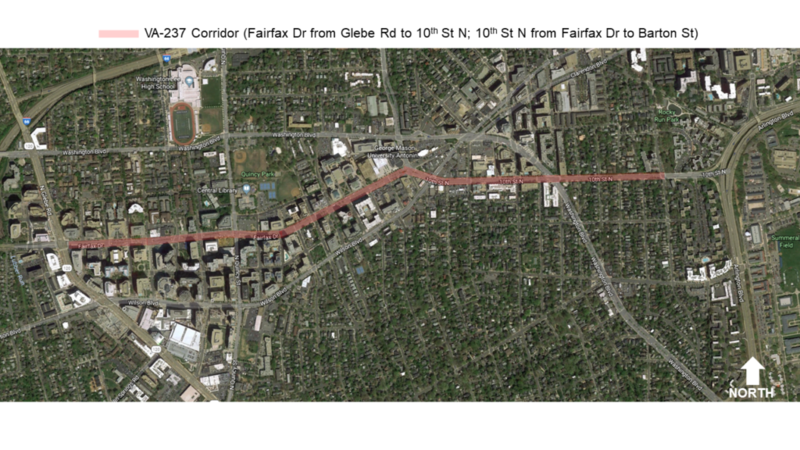 Arlington County acquired jurisdiction of the VA-237 Corridor (Fairfax Dr from Glebe Rd to 10th St N; 10th St N from Fairfax Dr to Barton St) from the Virginia Department of Transportation (VDOT) on July 1, 2018. Arlington County is currently evaluating the corridor to identify short-term, quick-build projects to enhance safety and mobility on the corridor. See map below for the corridor limits. More detailed maps/images of the corridor. The corridor area runs east along Fairfax Drive from N Glebe Rd (VA 120) to the intersection with 10th Street N/Kirkwood Road. The street’s name then changes to 10th Street N and continues east to N Barton St. The study area includes all intersections and street elements on the public right-of-way along this 1.5-mile corridor. While the full scope evaluation requires sizable resource and time, a Phase I evaluation with the objective of identifying “short term/quick build improvements” — issues that are both critical and can be addressed at current resource level – specifically regarding safety and mobility for motor vehicle users, pedestrians, bicyclists, and transit users. These issues and needs may vary in magnitude and priority along the corridor depending on context, as the character of the corridor varies from the Courthouse/Lyon Park neighborhoods through the Clarendon and Virginia Square neighborhoods and ending in the Ballston neighborhood. As part of the short term analysis, Arlington County staff will review existing plans/projects relating to the VA-237 corridor (including the Master Transportation Plan and its elements, neighborhood Sector Plans, approved site plans, and approved Capital Projects). Staff will identify key takeaways from these plans to integrate into the analysis. Arlington County staff will also conduct an inventory of corridor infrastructure and conditions. This will include collecting and analyzing multimodal traffic volume data, curbspace use, crash data, and transit service data. This data analysis in combination with community comments and input will guide the development of “short term/quick build improvements” (i.e., can be design and implemented within 0-2 years and can be addressed at current resource level) on the corridor. Long-term, large-scale improvements will be evaluated over the next several years as they require additional resources being sought and identified. In late fall 2018, Arlington County launched a three-week online public feedback form designed to gather input on travel behavior along the corridor and identify where improvements can be made in terms of safety, mobility, and accessibility. Additionally, County staff met with stakeholder groups through the corridor, including: the Ballston BID, the Ballston - Virginia Square Civic Association, and the Clarendon - Courthouse Civic Association to gather additional feedback from the community. View a summary of the results.